THE WRITING BUDDHA - Opinions | Books | Movies: The Girl of my Dreams by Durjoy Datta (Book Review- 3.75*/5) !!! 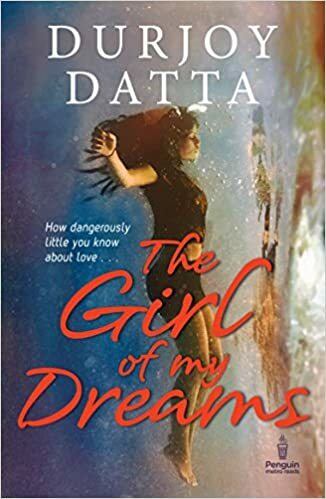 The Girl of my Dreams by Durjoy Datta (Book Review- 3.75*/5) !!! I love the timing of Durjoy Datta's books' releases. As soon as you start feeling that it has been a long time since you read his last book, you come to know that next one is about to be released. And Durjoy Datta's novels have that feeling which makes you nostalgic about your days when you started reading Indian authors initially and liked reading love stories which seemed realistic. Not many authors have come out of that zone of writing the typical love stories except few and Durjoy is definitely one out of them. He has grown as an author immensely in his last 3-4 books and now in his latest one named "The Girl of my Dreams", Durjoy Datta have tried thriller and let me tell you, he has passed with good marks. The Girl of my Dreams is about the protagonist Daman who is facing challenges in his life after surviving a deadly car accident. His girlfriend, Shreyasi, was with him in the car and he feels that because he was driving that day, he is guilty of her death. Now he has a new girlfriend, Avni, who is not very happy in a relationship because Daman is a writer and he names his virtual girlfriend as Shreyasi even after Avni asking him to use her name several times. The whole thing becomes chaotic and difficult for all the characters in the book when Shreyasi comes back in the story. Everyone is confused that she was dead then how could she return back in flesh and blood. And from here onwards, the curiosity of the reader starts growing with each page. The characterization of Durjoy has always been mind-blowing and even in this book, each and every character is so well developed and defined and you can actually imagine them. Right from Daman’s confused character, Sumit’s helpful one, Shreyasi’s destructive nature to Avni’s composed one- every character has been given justice. Even Jayanti’s and Karthik’s character is beautiful portrayed and not treated as side characters in the book. The first half is exciting as you want to know what thrilling events are about to happen in the story and as Shreyasi’s character enters once, the book takes a different turn altogether. The 2nd half is well-written describing the struggle of Daman and Avni against the evil play of Shreyasi. As a reader, even you are in panic while turning each page. The segment where the car is been burned is one of the most terrific parts of this story. The climax is also nicely closed and does not let you feel that in the name of thriller, you have been given a plain story to read. It feels as if a good romantic thriller has been gifted to you after a long time by an Indian author. I got a feel while reading this book as if I am reading a Novoneel Chakraborty’s book. Talking about the drawbacks, I felt that climax could have been little more hot and spicy as not much happens in the end. Also, not much is explained in the end about behavior of Daman at different point of time throughout the story. There were many things that were not justified in the climax which makes you feel little incomplete. Except that, The Girl Of My Dreams is a treat for Durjoy Datta’s fans. I give this book 3.75* out of 5. Happy 27th Birthday to me!! Really?